In roofing construction, as in life, it’s often the little things that can really let you down. Fortunately, Climaseal anti corrosion screws and fasteners can make all the difference to your roof. 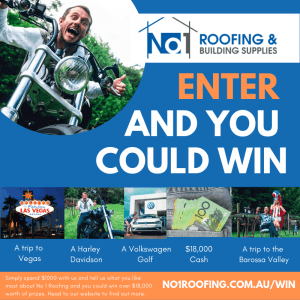 We all know that corrosion is a major problem for roofs in Australia but did you know that using the incorrect roof screws could lead to the complete failure of your roof? Trying to save some money by using inferior screws is a recipe for disaster. 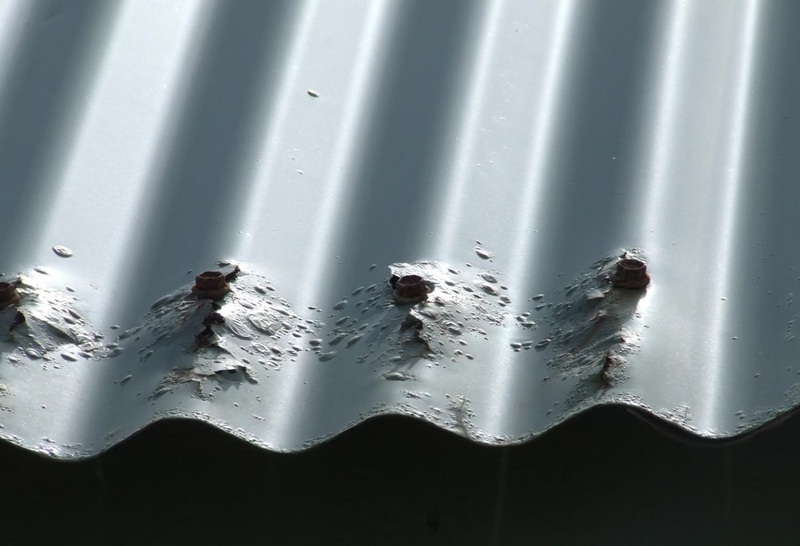 You need to use anti corrosive screws to avoid premature corrosion and expensive and unsightly damage to your valuable roof. Climaseal roofing screws by Buildex use a unique formulation and coating process specially designed with our severe marine climate in mind. 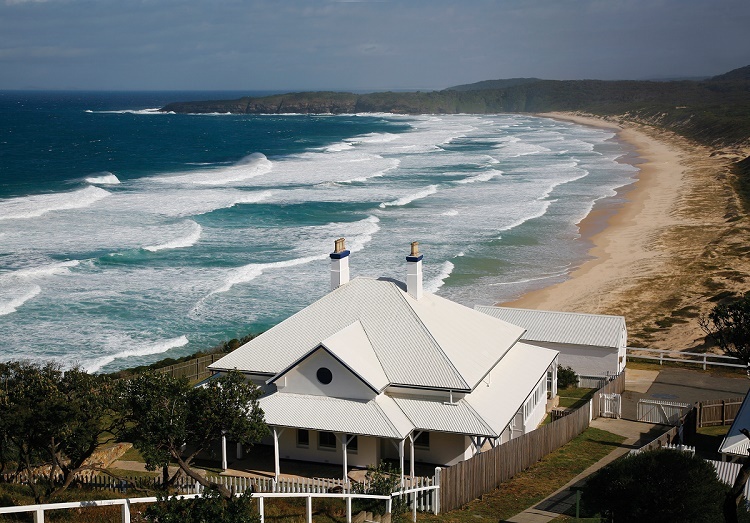 Although everybody loves the beach and most Australian housing is affected by marine conditions to some extent these are some of the most severe rust causing environments to build in. You’ve invested heavily to live in this amazing area and you need to know your investment is protected. You need the special protection of Climaseal anti-corrosion screws. Climaseal fastenings give you real peace of mind with superior rust protection guaranteed. What are the advantages of Climaseal fastenings? 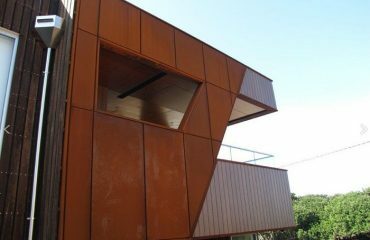 The Climaseal advantage includes a wide range of screws and fasteners from roofzips to timber and metal self drilling screws and in a range of Colorbond colours. Displays enhanced compatibility between screw and roof material, which helps to prevent galvanic reactions causing rust. This includes the washer, which can be a major cause of early failure in inferior screws. Buildex are so confident in the Climaseal difference that they guarantee Climaseal 5 products for up to 30 years in marine and 40 years in urban environments. A longer lasting roof, no ugly rust stains around the screw heads, no expensive premature repairs—now that’s a real return on your investment. Climaseal is a superior formulation and method of coating that provides a thicker, more even base and top coat. This creates a more durable corrosion resistant zone and protects your steel roof for longer. Cross-sections of inferior coatings side by side with Climaseal show a markedly superior performance in Climaseal’s coating integrity against chipping and cracking. Other galvanized screw coatings quite literally crack under the strain, not Climaseal. 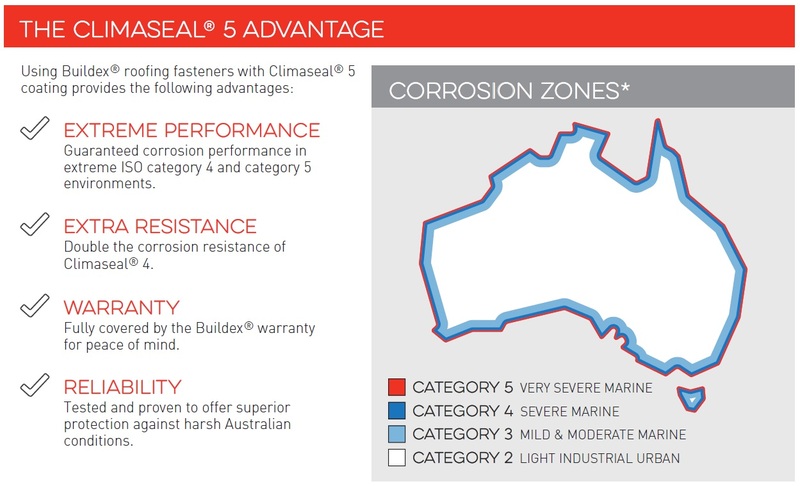 What’s the difference between Climaseal 5 and Climaseal 4? Climaseal 4 are rated as class 4 roofing screws and Climaseal 5 are rated as class 5 roofing screws. They are designed for the Australian corrosion zones ISO 9223 known as severe marine and very severe marine. 1km to 50kms from the ocean or 150m to 1km from a salt water creek or inlet Buildex will guarantee Climaseal 4 for 20 years and Climaseal 5 for 30 years. 400m to 1km from the ocean or within 150m of a salt water creek or inlet Buildex will guarantee Climaseal 4 fasteners for 12 years and Climaseal 5 for 25 years. 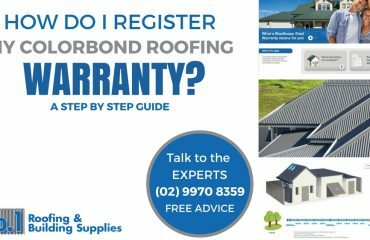 Replacing your roof can be expensive business and you want it to last. Climaseal gives you the confidence that your roof will last the distance and provide a real return on your investment. Buildex started in Australia in 1917 and has established a global reputation as one of the leading manufacturers of screws and fasteners on the planet. Buildex is proud of its Australian roots and its 19,500 square metre manufacturing plant in Melbourne supplies all its Australian customers’ needs as well as exporting to 18 countries throughout Asia, Africa, Europe, and the Pacific. Buildex was the first company to begin testing anti corrosion coatings in real world outdoor conditions in 1994. This continuous research and development programme has put Buildex to provide truly superior fasteners and screws. One recent unintended test highlighted Climaseal’s superiority to other fasteners in graphic fashion when a builder ran out of Climaseal screws partway through a job and had to finish with an inferior screw. The results were dramatic with the Climaseal screws remaining free from corrosion while the other screws quickly deteriorated. If having a dependable roof over your head is important to you then don’t cut corners. Get your roof screwed good and proper with Climaseal from Buildex.